“You will never be happy if your happiness depends on getting solely what you want. Change the focus. Get a New Center. Will what God Wills, and your joy no man shall take from you.” – Ven. Fulton Sheen. 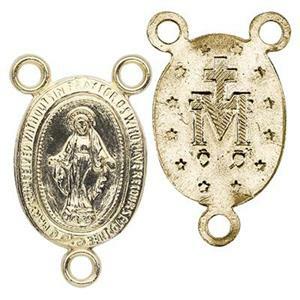 Our GF2091 – 14/20 Yellow Gold-Filled Miraculous Medal Rosary Center. These have three 1.1mm Inside Diameter Rings which will accommodate 18 Gauge or Thinner Gold-Filled Jump Rings. Create a special look to your design by adding our Gold-Filled Footage Chain between your Rosary Beads.